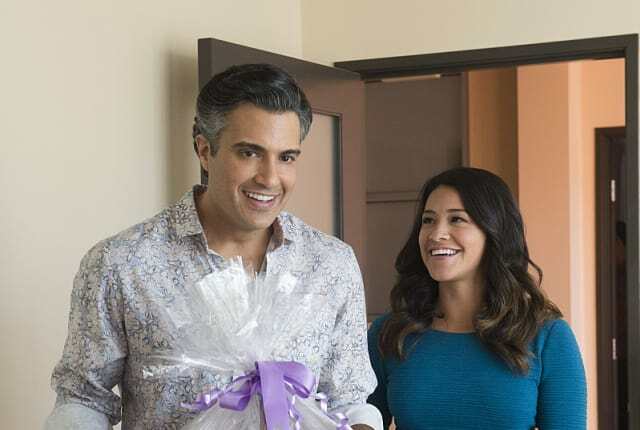 On Jane the Virgin Season 1 Episode 12, Jane has a difficult dilemma at her internship, while the reveal of Sin Rostro gets closer and closer. Find out who the crime boss is when you watch Jane the Virgin online now. On Jane the Virgin Season 1 Episode 12, Luisa asks Rafael and Jane to join her in therapy to ask forgiveness of the wrong she has done. When the go, Rafael reveals his suspicions of their father being Sin Rostro and corners Jane to ask that she get a letter to Rose, with an explanation of her own Sin Rostro beliefs. During her internship, Jane is asked to write an entire episode of "The Passions of Santos." Unfortunately, the episode is revealed to be Rogelio's character's death and is unsure how to approach it. With Ivan gone, Petra is on edge at the Marbella and hopes that Milos will not find her at the hotel. But, when Rafael threatens her job, she is forced to continue working and runs into a familiar face. Michael continues to search for who the real Sin Rostro is after he is suspended from work and finds new evidence related to the case. Can Luisa be trusted? Will Jane write her father's death scene? Who does Petra run into? Are Michael's suspicions finally correct? Find out when you watch Jane the Virgin online now. On Jane the Virgin Season 1 Episode 12, Jane gets a fantastic opportunity at her internship, but it comes at a price. Meanwhile, Rafael continues to learn more about who Sin Rostro could be.